Good afternoon! Our next strong cold front is quickly approaching. This front will bring in a round of rain and a cold blast of air. Even though a little light rain or a few showers will be possible throughout the day, the rain really won’t start to pickup until this evening and overnight. A line of showers will develop ahead of the front and drop from northwest to southeast across the area tonight. Widespread heavy rainfall and strong storms are not expected. Rainfall totals will likely range from 0.5-1.5″. Gusty northwest winds and much colder air will follow the front. With colder air pouring in and rain lingering, a wintry mix of precipitation will be possible Wednesday morning. The rain will move out by Wednesday afternoon, but it’s going to be very chilly. Today will likely be the warmest day this week, and maybe beyond. Highs will be in the low to mid 60s, which is above average for this time of year. Most of us will be blanketed by a heavy dose of clouds. 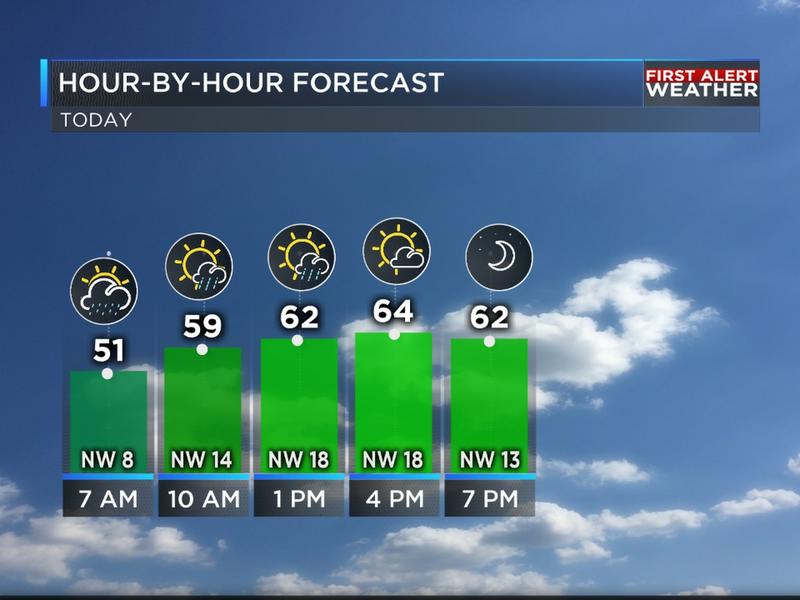 A few showers or little light rain will be possible throughout the day. Today is also going to be breezy. Expect a southeast breeze at 10-15 mph. A line of showers will begin to develop ahead of a cold front this evening, so make sure to have your rain gear handy this evening and overnight. Heavier pockets of rain will likely develop within this line of rain, but severe weather is not expected. Temperatures will start to tumble and the wind will shift directions to be out of the north once the cold front passes you. By Wednesday morning, temperatures will be in the 30s area wide. However, a gusty northwest wind will put wind chills in the upper 20s almost area wide. Rain will linger Wednesday morning. Even though it’s not likely, a wintry mix of precipitation will be possible where temperatures drop below freezing Wednesday morning. Accumulations and major travel impacts are not expected. Wednesday afternoon will be very chilly. Highs will only be in the low to mid 40s. Under a clear sky, temperatures will tumble below freezing Wednesday night. Lows will be in the 20s and 30s. The rest of the work week looks cool. Temperatures will rebound a little on Thursday, though. Highs will be in the 50s. A reinforcing shot of cold air will arrive Thursday night into Friday and knock our temperatures back down. Highs on Friday will only be in the 40s. The chilly weather will stick around for the weekend. Highs on Saturday and Sunday will be on either side of the 50 degrees. A few showers will be possible on Saturday, but Sunday should be dry.